The easiest way to get a total body workout in just minutes a day! Seated exercises with double seat roll bars safely supports your back. Folds and rolls away for fast easy storage. "It's so convenient! I just unfold it and start working out instead of going to the gym." Safely supports the back while exercising. When ordering today, you get the option of three different Chair Gym bundles available for just 5 easy payments plus FREE Shipping and Handling. 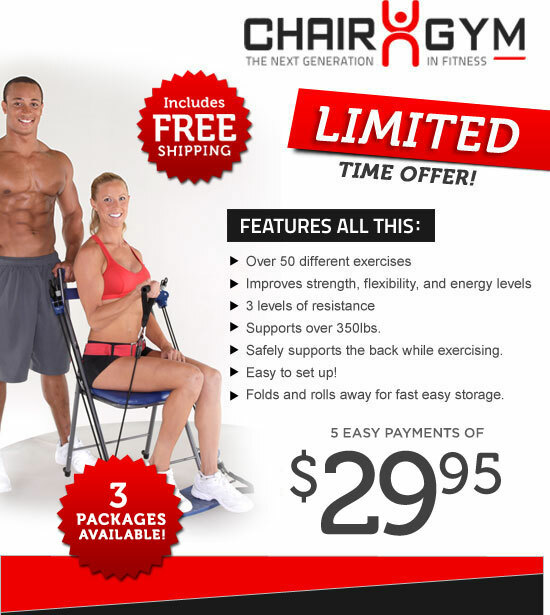 Option 1 - Chair Gym Ultimate Deluxe option includes the Chair Gym system with the twister seat for those hard to reach love handles and 3 Bonus Workout DVD's for just 5 payments of $44.91, or 1 easy payment of $224.55 + FREE Shipping! Option 2 - Chair Gym Ultra Deluxe option includes the standard Chair Gym with three levels of resistance and the Twister Seat attachment for just 5 payments of $35.94, or 1 easy payment of $179.90 + FREE Shipping! Option 3 - Basic Chair Gym bundle includes the Chair Gym system with three levels of resistance for just 5 payments of $29.95, or 1 easy payment of $149.75 + FREE Shipping! Residents of NJ, NY, NV, and CA add applicable sales tax. A $10.00 surcharge applies to orders shipped to Alaska & Hawaii and $20.00 for Puerto Rico.